My heart sank when I opened up my bag of fish and I saw these huge eyes staring at me reproachfullly. This was not what I was expecting! You see, we had been in Kadıköy on the Asian side of the Bosphorus, where we enjoyed a simple fish lunch at one of those bustling little places there – not at all fancy but really nice. You choose your fish from the stall outside, they cook it and then you sit down and eat it. You can even have a glass of wine. 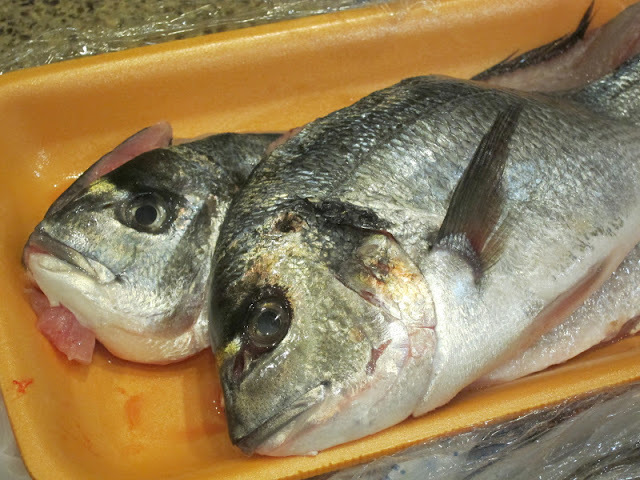 We also ordered two çipura or sea bream, to take home with us and asked for fileto/fillets. I wanted to cook them the next day in paper/kağıtta. But no, prepared like this, heads on and all, paper would not do! I must say, living in Turkey teaches you to be flexible if nothing else. 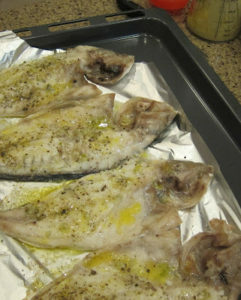 The following recipe is a good one to have up your sleeve: the lemon juice, garlic and melted butter combine to make the fish really tasty and succulent. Garlic is always good! You can use this with any firm white fish, again, fillets would be best but it worked just fine with these two beauties. With a few boiled potatoes and a green salad, a healthy and satisfying dinner was on the table in no time flat. 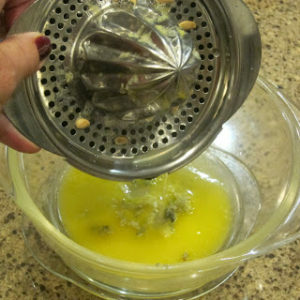 · Line an ovenproof baking dish with cooking foil and brush with a little of the melted butter. 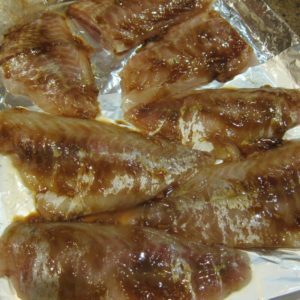 · Place the fish fillets on the tray and rub them with a little of the salt and pepper. Mix the lemon juice, crushed garlic, the rest of the melted butter, the remaining seasoned salt and black pepper, and pour over the fish. · Cook for 25 mins or so till done. Again sea bream/çipura but this time I bought it from my local supermarket, a 3M Migros. I have to admit that the fishmongers there do a better job of cleaning the fish than they do in the markets, and they did make beautiful fillets out of it. I marinated it yesterday morning along the lines of Trout with Clout ie with oyster sauce (yes, we can get it here! ), soy sauce, and sesame oil. Covered with clingfilm, it stayed in the fridge until I baked it in the oven in the evening. Very simple as fish usually is yet absolutely delicious. Both of these fish recipes look fantastic! I have the opposite problem…where I always try telling the fish mongers NOT to cut off the heads and keep it whole. When I go to the same guy in Besiktas, he finally understands what I want. =) But yes, it's always helps to be flexible here. Your little fish restaurant place in Kadıköy sounds very similar to Fethiye fish market. we love going there to have our fish cooked for us. Thanks for these recipe. We eat a lot of fish and I'm always looking for new ways to cook it. I love the simple lemon garlic butter rub. I don't think I could have coped with those heads, though! Lütfen temizleyin ve fileto yapın! This is Claudia BTW!!!!! Oh I made the courgette and walnut muffins for some friends last week and they loved it, thanks for posting that recipe. Garlic, butter and lemon – perfect! I can almost taste it. I just read a very similar recipe where a sprinkle of raki and some dill is added – just back from Turkey I think I will try that one with some dorades soon. BTW: Like the new design of your blog, Claudia! Hi Barbara! Were you with your friend near Izmir? It's been extremely cold – you haven't been very lucky with the weather during your visits here!! I think I would like your fish restaurant. You can tell from the eyes that those are very fresh fish. Your recipe for the fish sounds wonderful. Have a good day. Hi Michel! I do love your comments! Are you in Sablet now? I envy you!! Yes, the eyes are the test, aren't they? Yummy cipura, Claudia! I know what you mean with getting the whole package with fish – tails, eyes and head! in Turkey! Mind you, mum always says the head is tastier:) Enjoy the cipura for me – loved the garlicy sauce! Hi Özlem! Nice to hear from you! 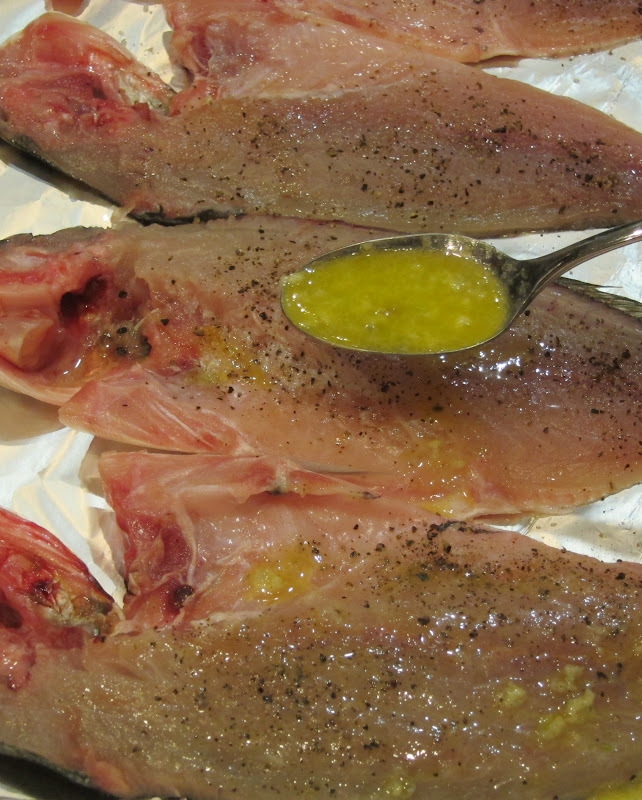 I know they say that about the head but frankly fillets are just easier to eat …and garlic: yum!